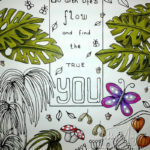 Home » Blog » Go with life’s flow… and then what? If you’ve read my latest blog carefully, you might have noticed that I talked about the FIVE drawings that I’ve made for the Costa Women Make It Happen 2019 Planner. But I’ve only shown FOUR! While writing that blog I was in a certain flow that I didn’t want to disturb. And telling about that last drawing just didn’t fit in. So here’s the missing part, about the last coloring page that I’ve drawn for the planner. 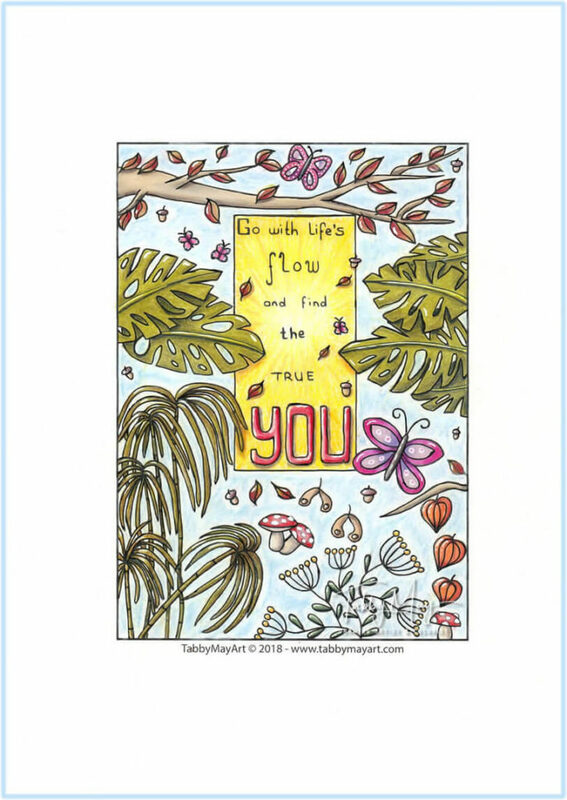 And it’s also the drawing that’s being used now for the coloring contest, where you can win a free copy of the Planner! 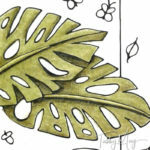 So I started drawing Monstera leaves. And I wanted a nice, inspirational text to add to the page. This wasn’t very easy and I searched on the internet to find something that appealed to me. To no avail. Therefore I had to come up with something myself. 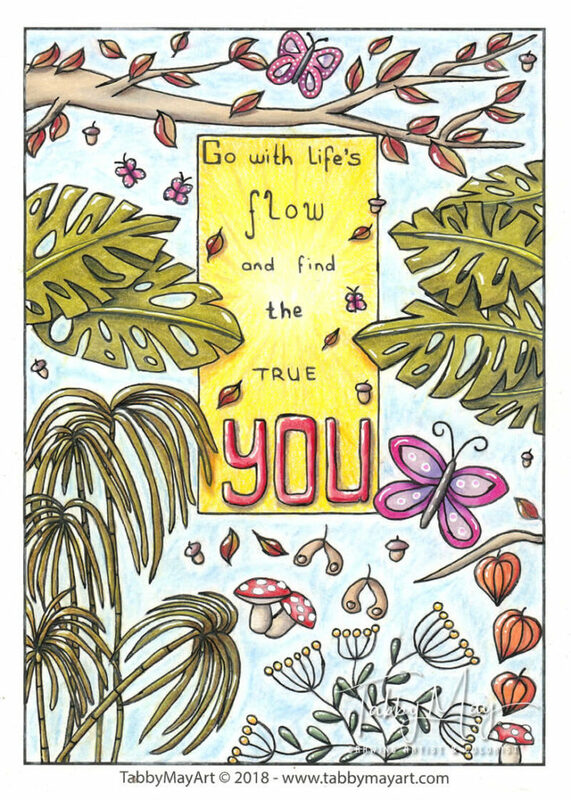 I tapped into my inner poet *ahem*, and came up with the words ‘Go with life’s flow and find the true you’. Hm… maybe not all that poetic, but it does have a kind of ‘inspirational feel’ to it, don’t you think? Oh and I’ve added some bamboo-palm-papyrus-like plants and a plant with flowers that look like candle holders. No idea if plants like that exist in reality. But who cares, nobody said it needed to be realistic 😀 . I am actually very pleased with the outcome of this particular drawing. And in the end I figured this was the best drawing to use for a coloring contest. Then came a new challenge: coloring my own design. Of course I’ve done that before, but not with drawings of mine that were out in the open. As in ‘published’, for others to see. I wanted to provide a colored example, for people who want to join the contest. And yesterday I’ve finished it and I must say that I’ve had a lot of fun with it. It also made me feel so very proud, working on my own drawing, finishing the total picture by adding colors and shading. 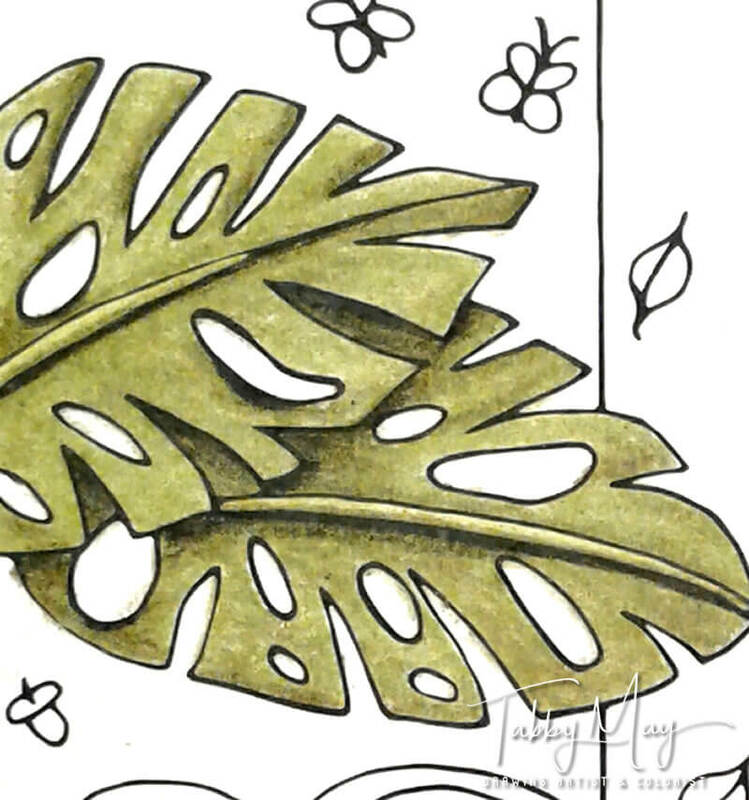 The design is in A5 size, so printed on A4 paper it looks like the small picture on the left. I’ve worked with Prismacolor Premier colored pencils. For highlighting I’ve used a water-base white Sharpie. And all the black lines were traced again with a black Uni-Ball Eye UB-157. 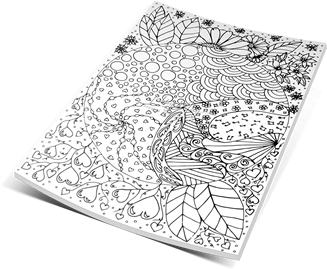 The design was printed on Kippers 175 grams Water art paper. Joining or not joining the coloring contest is up to you! Now the story is complete. I’ve told you all about my journey of drawing five designs for the planner. And maybe you can imagine that I’m very curious to see YOUR colored version of this drawing! So…. what are you waiting for? 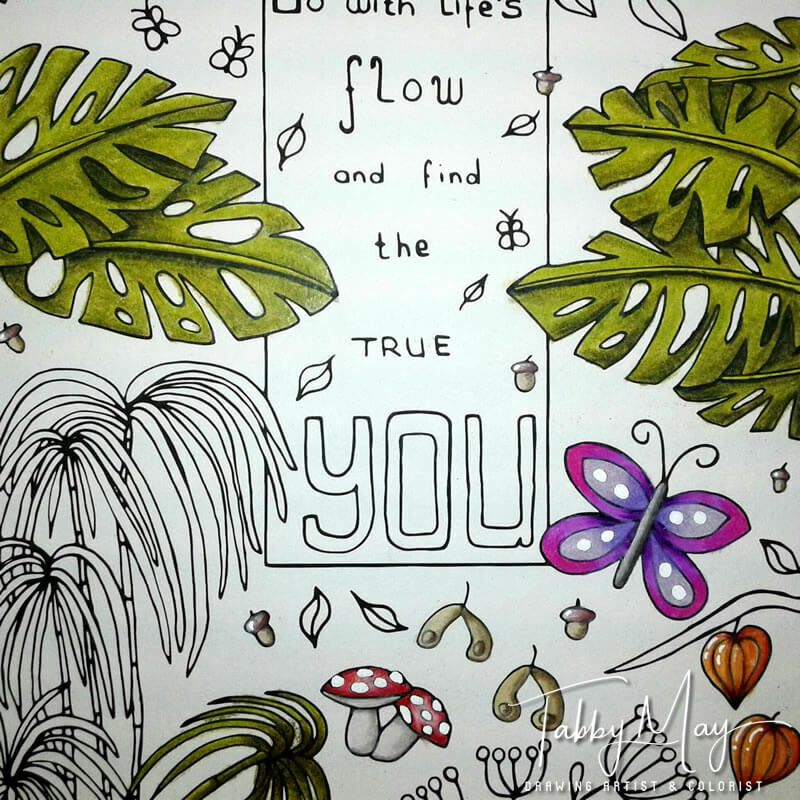 Download your free coloring sheet HERE and at the bottom of the previous blog I’ve written what you need to do to win a copy of the Costa Women 2019 Planner. Hope to see you back on my website soon! And if you’ve got things you’d like to see from me, related to coloring and art, don’t hesitate to ask and leave a comment below.